100,000 dead fish Florida – offical story: NO OXYGEN ? First it was birds falling out of the sky in Louisiana and Texas. Then scores of devil crabs were found dead on a beach in England. 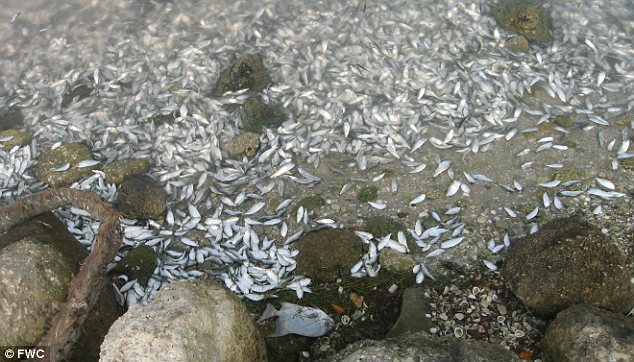 Now, in the latest unexplained mass animal death to hit the headlines this year alone, thousands of fish have again washed up dead in Florida. This follows similar incidents where large schools of fish were found lifeless on beaches in Arkansas, Maryland and New Zealand in January. 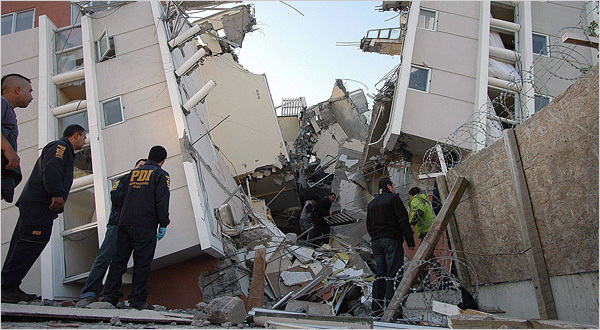 NEAR EPICENTER Concepción, Chile’s second-largest metropolitan area, was badly damaged in last February’s quake. When a magnitude-8.8 earthquake struck off the coast of Chile last February, geophysicists and seismologists were not surprised. The quake’s epicenter was on a roughly 200-mile stretch of a fault where stresses had been building for nearly two centuries, and experts had expected that one day the strain would be relieved in a cataclysmic event. As evidence mounts that the world may fast be slipping into the next Ice Age, Washington insiders are hurrying to solidify a new power base for centralized government operations. Fears that the US capital might be struck by another more deadly terrorist attack—or other disasters—prompted agencies a decade ago to hurriedly establish back-up operations in case catastrophe struck. Despite the fact that many conspiracy theories are weaved around the subjects that follow—including some fairly wild-eyed, tin foil hat scenarios—most conspiracy theories have a basis in fact, although the facts are distorted or wildly exaggerated. An Iranian university has announced the imminent unveiling of a domestically built supercomputer with high-tech computational features, a report says. The national supercomputer is capable of processing 34 billion operations per second with a speed topping 40 gigabytes within the same time span, Mehr news agency reported on Monday. Officials at Tehran’s Amirkabir University of Technology (AUT), which will display the computing machine, said that the Iranian supercomputer is capable of processing data and carrying out computations in an array of fields. High-capacity supercomputers are viewed as strategic products and the Iranian computational device will rank amongst the world’s first 500, the report said. Supercomputers, primarily introduced in the 1960s, are at the frontline of current processing capacity, particularly speed of calculation. The machines were introduced in Iran around 10 years by the AUT. Iranian engineers and technicians have been making efforts to increase the computational capacities of the devices ever since. Supercomputers are used for intensive calculation tasks such as problems involving physics, weather forecast, climate research, molecular modeling, simulations of airplanes in wind tunnels, nuclear research and computations in nanotechnology among others. Ancient Folklore most of the time can be traced back to some actual event. The folklore around Nibiru and planet X goes back thousands of years, and can even be seen in the symbolism of every day architecture provided to us via secret societies, mysticism and most religions around the world. Commonly referred to as the Crossing Planet, Planet X, Nibiru, Winged Orb, Nemesis, Wormwood, The Death Star and the Destroyer. This mystical heavenly body very well may exist. Given the misinterpretation of planet X actually being a planet, is the first mistake, which has likely led to the lack of supporting scientific evidence of its existence. 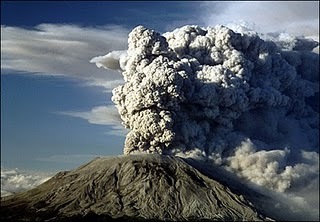 Only the misnomer of Planet X would allude to this planet actually being a planet. According to mystical and esoteric history, Planet X is not a planet at all but a Brown Dwarf star, that may have its own orbiting planets. Infrared anomalies were found in the Sagittarius constellation, and Lloyd believes the ‘dark star’ lies in this direction. Irregularities in the Kuiper Belt (a region beyond Neptune), such as objects with odd inclined orbits, indicate that science is catching up with the idea of a Planet X, he pointed out. It’s possible, he added, that NASA already discovered such a celestial body years ago, and has deliberately kept its presence a secret.